I'm Here. I'm Queer. What the Hell do I read? : The More Gay-Friendly A Community Is, The Better It Is For Straight Teens, Too! The More Gay-Friendly A Community Is, The Better It Is For Straight Teens, Too! 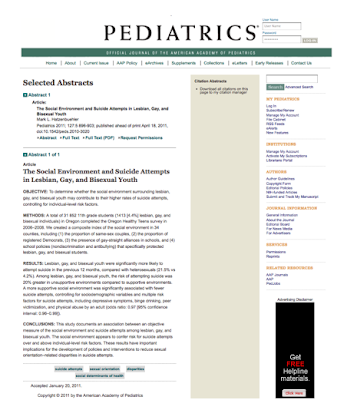 This study of 11th graders in Oregon, recently published in the journal Pediatrics, found that the environment being supportive or not directly impacted not only attempted suicide rates of Gay, Lesbian and Bisexual students, but of ALL students. 5) proportion of Democrats in the county. The rates of attempted suicide in the more gay-friendly communities were 20% lower for Gay, Lesbian and Bisexual students and 9% lower for heterosexual students. If schools needed to justify anti-discrimination, anti-bullying, and celebrating diversity programming to non-queer communities (Have I mentioned I'm booking speaker visits for the 2011-2012 school year? ), this data should help them make the point that the safer we can make our culture and schools for queer students, the safer it will be for everyone. Makes sense. It's not just queer people that are affected by anti-queer bullying: the pressure to not seem gay (or trans) can be overwhelming even for straight, cis students. Anyone who steps out of line can be labeled gay, and if that's an insult in itself, everyone is vulnerable. I guess what I find heartening is that everyone is empowered by a space being safer for queer teens. Drawing the connections between homophobia and racism and misogyny and all the other forms of bias and prejudice just brings us closer to a world where differences are celebrated. Great post! I had never thought about that before but this is so true. Thanks for your comment, Sheila. I agree - it IS impactful. I think number 5 was probably the point of the study, but I believe the correlation between GLBT support and all teen support is obvious. All human beings need to feel accepted for who they are. All of us need to valuable and necessary to the human community. I am fortunate enough enough to go to a church where GLBT is a moot point. No one cares. We're all just fellow humans supporting each other. I want this to be true for the rest of the world. And I believe it will be. It should come as no surprise that a community that has a tolerant, understanding, supportive atmosphere is a happier place for all to live than a place with a threatening or oppressive atmosphere. Witnessing the abuse of others is not conducive to anyone's happiness or health.